With a reform-oriented administration vowing to address corruption and eradicate poverty, the recession and the need for genuine institutional reforms, civil society groups met to contribute to the shaping of the administration’s legislative agenda. 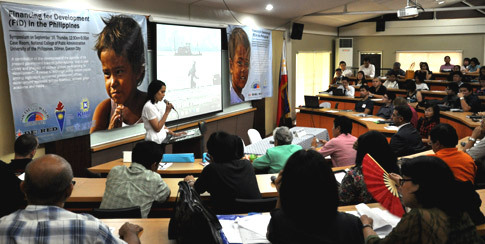 The National Institute for Policy Studies (NIPS), with the support of the Friedrich Naumann Foundation for Liberty (FNF), held a symposium entitled Financing for Development in the Philippines on 16 September 2010 at the UP National College of Public Administration and Governance (UP NCPAG) to serve as a venue to make policy recommendations to achieve the Millennium Development Goals (MDGs). 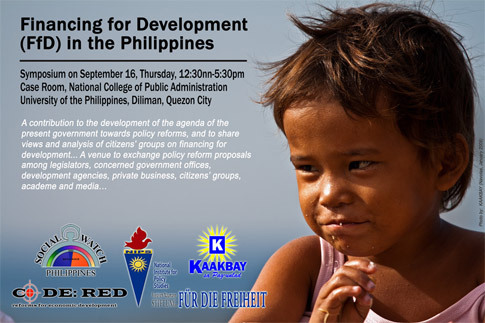 Civil society groups Social Watch Philippines (SWP), Code:RED and KAAKBAY CDI co-organized the event where they also launched the book Financing for Development: Finance or Penance for the Poor. Book author Prof. Leonor Briones, and editor Mr. Filomeno Sta. Ana III were the resource speakers at the symposium. 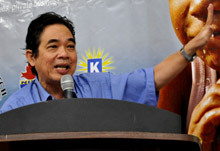 Liberal Party (LP) Director General Atty. 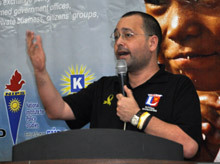 Chito Gascon, in his opening remarks, affirmed that both the NIPS and LP are committed to the process of engaging civil society in mainstreaming policy reforms especially that LP is now the governing party. He opined that active civic participation is needed as it is not realistic to expect political leaders to do it alone. The symposium was a way to continue dialogue as the government tries to address the needs of the poorest of the poor. “In determining public policy direction and options, cleavages or conflicts are inevitable. What is important is that we build on gains from continous dialogue over time,” said Atty. Gascon. Mr. Sta. Ana, Coordinator of the Action for Economic Reforms (AER) posed the question “Where do we get the funds if we are to attain the MDGs in 2015 and help the poorest of the poor?” He then proceeded to discuss the opportunities, limitations and constraints in mobilizing resources for development. He stated that among the roadblocks to financing, MDGs being underfunded is the most pressing, and that tax reform is urgent. One notable recommendation, but highly lobbied against, is reforming excise taxes on sin products like tobacco products such as cigarettes and indexing these to inflation. Further, he said that for trade to be a source of funds, investments must be boosted by having industrial policies in place. The country cannot fully rely on OFW remittances as current trends show that a strengthend peso in foreign exchange is not enough, and a competitive exchange rate is necessary. 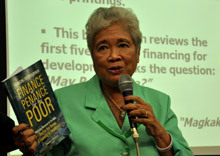 Professor Briones of the University of the Philippines and former National Treasurer asserted that finance is a major factor in achieving the MDGs. She stressed that it is important to monitor budget allocations for this purpose. “MDG goals are at risk because of inadequate funding. While there is medium possibility of achieving poverty reduction, the country also faces an alarming increase in poverty levels as reported percentages are aggregate amounts hence reaching problematic proportions, ” said Professor Briones. “The national budget continues to be characterized by huge deficits and is in itself deficient as it does not include consequent principal amortization payments,” Professor Briones added. She also pointed out that the decrease in agricultural and agrarian reform expenditures was particularly worrisome considering that most poor come from the agricultural sector. As lead convenor of the SWP, Professor Briones revealed that their study, as published in the book Financing for Development, shows that the country is below par in indicators like education, maternal mortality, environmental issues and global partnerships. To answer the question on funds, sources of financing for the MDGs are suggested in the book. She shared the recommendations for financing the deficit and expenditures, with particular emphasis on revenue measures and significant increases in taxes as the ultimate goal. Professor Briones also underscored the role of the civil society in ensuring that the national budget is suitably appropriated and rightfully spent. SWP is an international network of citizens’ organizations struggling to eradicate poverty and the causes of poverty, to ensure an equitable distribution of wealth and the realization of human rights. It is committed to social, economic, and gender justice. Social Watch holds governments, the UN system, and international organizations accountable for the fulfillment of national, regional and international commitments to eradicate poverty.